This is one of the modern supermarkets in Kathmandu. Although they are quite nice and you can find a lot of Western products difficult to find elsewhere, these modern facilities like this are more expensive than the local 'mom and pop' shops. The other problem we have is that we do not have a clue how much things should cost. Everything seems cheap because the rupee is worth little more than a penny to the US dollar and slightly less than a Euro cent for Europeans. Take a moment to breathe in that $30.00 is 3,000 pennies, really get that into your head and it may even help if you start converting dollars or Euros to pennies with purchases before you come to Nepal. Now, when you get here and a merchant wants 3,000 NRs. for a pair of sandals you realize that you could probably get that same pair, shipping included, back home for about $9.99, 1,000 pennies, or about 1,100 Nrs. Remember that is the ‘back home’ price. In the ‘things to do before you leave the West’ list in "Nepal: On a Budget," I suggest going to Pier One Imports to check the prices. After all, they import from Asia. Then when you are here and get accosted by a street vendor you will have some good bargaining prices in mind. Think of it as an IQ test. If you do not have a value in mind it is foolish to make a purchase; you will surely be outsmarted. Seriously, the next vender will have the exact item and will offer it to you for less. Then how will you feel about what you already bought? Women will be well advised to browse for costume jewelry before leaving home. Look at Avon, Monet, Dollar Store, etc. The touts sell lovely Monet or Avon style necklaces with beautiful stones. Although they will tell you they are natural many of them are composite, which is difficult to tell. Anything that is called ‘yak bone’ should be inspected very well. They surely must just sprinkle a little ground up bone in with the plastic and call it yak bone. I really do not know. There are a couple of tricks to determine whether or not the item is natural for things like stone necklaces and shawls. They are listed in Nepal: On a Budget. When you are least expecting it and are out to enjoy a local UNESCO site you will find yourself having to deal with the street venders. What to do? Keep walking and don’t look back. These people will hound you in Thamel and at the temple sites if you give them an opportunity. I have a difficult time being rude to people so I would say, ‘not today.’ So, the next time they see me they remind me and I really feel bad. They look so sweet and poor. But not only do they do quite well, but there is usually someone in the background that is getting rich off them. I got so when they start going on about life in Nepal being hard I suggest to them that in our next lifetime we should both chose be born in Denmark. My new strategy is to not look at them. Never act interested. One day I broke down and bought a flute from a man at Darbur Square who remembered how many times I had told him ‘no, not today.’ Suddenly there were about a half dozen other touts hounding me to also by a purse, a necklace or whatever, and it was like a parade following me. I didn’t even want the flute. He just looked so thin; I just wanted to feed him. Seriously, leave your bleeding heart at home and bring your logical mind to Nepal. 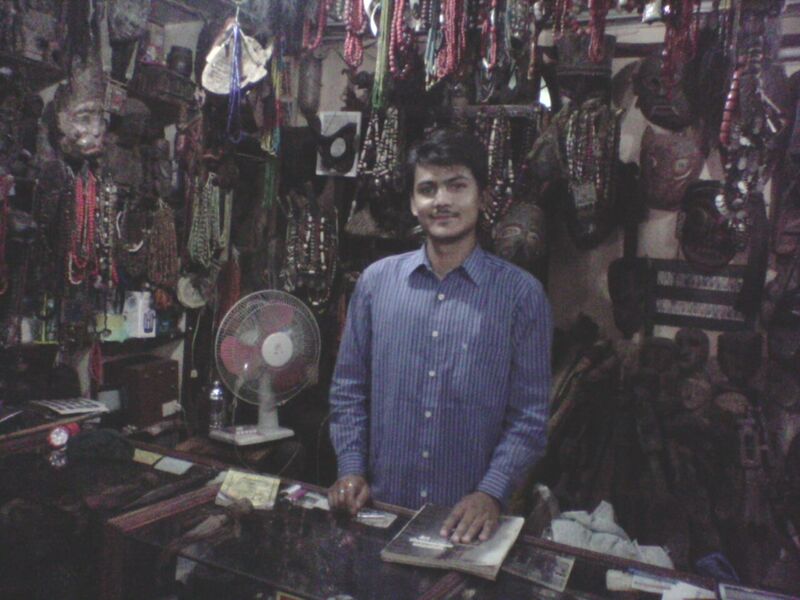 What kinds of things are great bargains in Nepal? My best find is Peacock feathers. I know Europeans are not so interested in them but they are quite expensive in the US. You can get a shipping tube so they will travel safely. Peacock feathers can cost as little as 15 NRs. each. Particularly if you are not average size or shape, you can have a pair of jeans tailor made for you at a myriad of places in the Kathmandu Valley for around 800 NRs. I suggest you only have one pair made to start with and see how you like the person’s work. If they cannot show you some lovely sample products that they have made don’t bother with them. The good jeans tailors have a lot of things to show you. I like how they can put the little Levi’s flag on a pocket for you. I'm sure you know you can buy pashmina scarves, thankas and pottery, but you might like to buy one of these stainless pitchers with copper lining. They cost under $10 in many of the open stall housewares shops and make easy to carry gifts back home. They actually purify water by storing it in the pot for four hours. How much would this cost back home? The Lonely Planet suggest trying Ju Ju Dau if you come to Bhaktapur, but fails to explain what it is. First, they are absolutely right; it’s my favorite thing since I got to Bhaktapur. However, it isn’t pronounced like it’s spelled. It’s pronounced ‘zu zu dah.’ King Curd is a sweet yogurt, and delicious. You can pay 90-120 NRs. 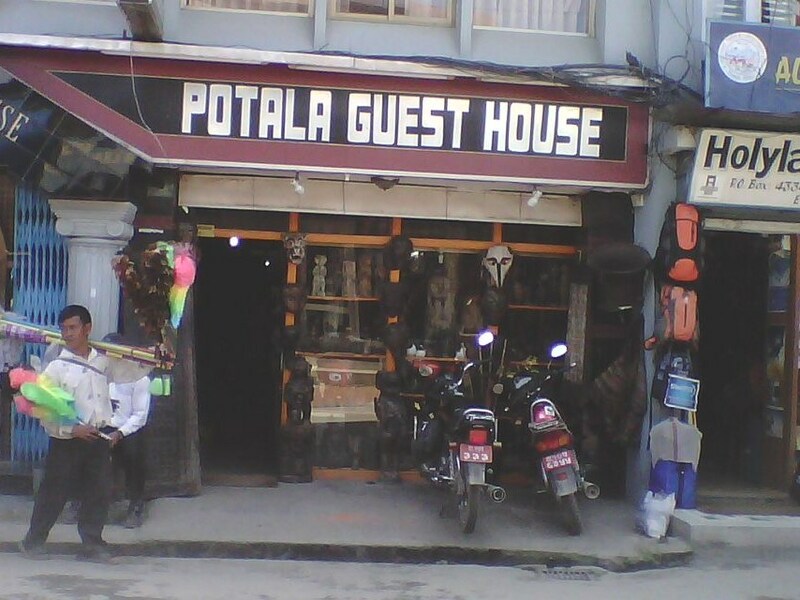 at the local guest houses for a small, single portion bowl or you can look for shops that sell it to the public. You can get an entire liter of ju ju dau in at least a dozen of these little shops all over Bhaktapur for 120-140 NRs. During certain times of the year you will see flies in the simi-refrigerated display case helping themselves to this delectable treat. Most likely due to the yogurt culture itself, I’ve never had a problem with it. However, I buy it in the plastic instead of the clay pot. I also take a good look at the cleanliness of the shop and the woman behind the counter. Sometimes it’s just a bit too scary, but if anything is worth the risk it’s ju ju dau. You may think this is a strange way to buy chicken, but this is my butcher. I go in and pick out a nice, healthy looking chicken and before you know it it's getting the rest of its feathers taken off with a blow-torch. I pay around 450-500 NRs. for a cleaned out chicken so fresh its still warm. I don't deal too much with red meat and even keep a chicken meal to a 'company only' experience. My final tip on shopping in Nepal relates to one of the most mysterious of all priced handcrafted items, the thanka. 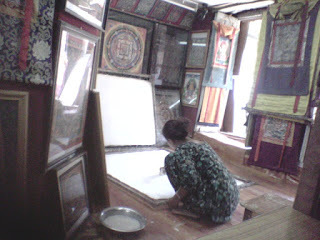 Thanka Painting Schools/Shops If you want to bring home something really amazing, and great gifts for friends, then a trip thanka shopping is for you. Seriously, you need to do the shopping before you leave and after you get here. These beautiful handcrafted paintings are very inexpensive in Nepal and you can easily bring several home with you. Many of the paintings have been designed by H.H. Dali Lama, himself. You will want to learn about the grades. This picture depicts a second year student. If you buy the first year students' paintings they can be purchased very reasonably, about $5-10 for the small size. You will want to purchase the thankas in the silk border rather than having to buy a mat and frame when you get back home. That will raise the price about $40, but it will make your thangka look even more beautiful. As you examine the thangka with the merchant/headmaster you will come to see the subtle nuances that make all the difference. Something most tourists are not aware of is that the same commission rate of upwards of 50-100% of the asking price is paid to the person who brings you into the shop. Even if they swear they do not take a commission they will come back later for it. If you do not know what you are looking at you can really get cheated at many of these businesses. I do have one thanka school I like to suggest. If you are in Changu Narayan Temple Village, see Sanjaya or Kamal Bhujel at the Sunapati Thanka Painting School, you will hopefully get a good value and a pleasant shopping experience. Be sure to mention this blog or my name, Ama. Sunapati Thanka Painting School, Changunarayan, Phone: 9841111599. There are several thanka schools as you walk up the steps. The Sunapati Thanka Painting School is located about half way up the stairs, across from the museum. There is a 300 NRs. admission to see the village, but it is very ancient and quite nice. There are are a few guesthouses and home-stays in the village; it is a very relaxing place. I would like to tell you a little bit about Sanjaya. He is like a son to me and unlike many Nepali, he always brings me something when he comes to see me. He cooks and cleans my kitchen and is always smiling. I’ve hosted couch surfers and encouraged them to see Changunarayan with Sanjaya. He would come and take them wherever they wanted to go and only one has purchased anything from his store. He has never once made a negative comment about what they did or did not buy and always offers to take the next one for a day of site seeing. None of them have even offered to give him any money for taking the day off to spend with them. Such a great attitude makes him easy to recommend. Please leave a post below to tell us about your experience. Especially if you have a disappointing experience please let us know so I will stop referring to him. So far he has been wonderful. These lovely pottery pieces that you can purchase for so cheap, are all hand crafted. This is a family run pottery studio in Bhaktapur. I always enjoy showing off my amazing, ancient village. We have one of the most amazing views of the valley here and a very beautiful temple and village. Thanks for including our school and store in your blog. I wish you good success on your book. Congratulations on your award on your blog! I really hate shopping, so I try to avoid it for the most part while traveling. However, since I was in Nepal for about eight months, I found myself in the dreaded situation of having to buy new shoes and new pants. The shoes weren't too hard, but finding a comfortable pair of jeans proved to be nearly impossible. I'm a fairly small guy and I still had a hard time finding jeans that fit; or even ones big enough to slide a pencil through the legs.